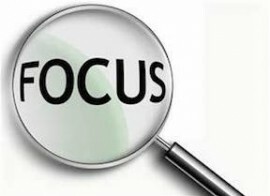 Focus and concentration are considered synonyms and used interchangeably in conversation. However, while the words are similar, they have different meanings. This can be illustrated best by looking at a workout at Vertex Fitness. In the broadest sense, both the trainer and client have the same focus, which is to workout in an effective, efficient manner to promote positive changes in the body. Focus means to be aware of where you are and why you are there. Concentration is the ability to focus one’s attention on a specific activity. With respect to strength training, the client concentrates on the specific muscle(s) being worked and the trainer is concentrating on teaching and coaching each repetition. You can easily see how focus and concentration are similar and different in the above paragraphs. The two are not mutually exclusive, though. Sometimes, clients come to the studio intent on working out and just go through the motions, not really concentrating on each exercise. Sit perfectly still for 5 minutes (yes, you can blink). Pick a nice comfortable chair, sit with your head up and shoulders pulled back (what used to be called good posture) and DON’T MOVE A MUSCLE! It doesn’t sound hard, but try it. Once you can do 5 minutes work your way up to 15. Count backwards. Again, sit down and start counting backwards. You can pick any challenging number (e.g. 100, 150, 1000) and work your way back to zero. It’s not a game of speed. Clearly enunciate each number. Once you get good, challenge yourself by going backwards by three or five. Count a paragraph. Pick out a paragraph and count the words. Re-count to make sure you counted correctly the first time. When you are proficient, do a whole page of a book. Only count using your eyes! These simple exercises will help improve your ability to concentrate. The best part is that the ability to concentrate can then be applied to whatever situation you find yourself in. 10 Ways to Eat Better at WorkYou Can’t Out Run a Bad Diet!